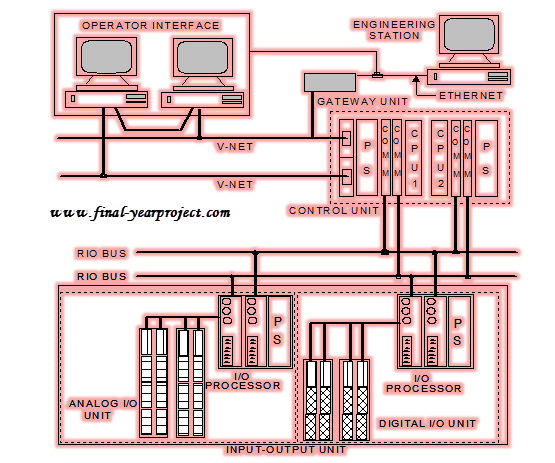 This is control engineering project report on "Implementation of fuzzy logic on DCS Kit". I-7000 is the trainer kit used in laboratory for making students familiar to the DCS environment and its working in industry. The whole arrangement requires a system with operating system and process loop to be controlled by software DASYLAB installed along with the DCS kit. The market cost of the DASYLAB software is approximately Rs. 4.0 lacs. You can also Subscribe to FINAL YEAR PROJECT'S by Email for more such projects and seminar. 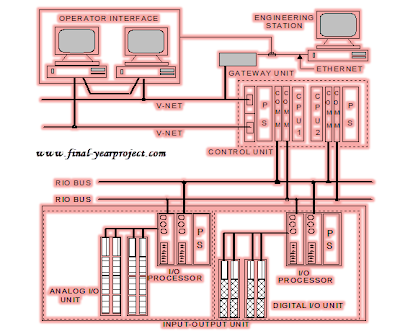 This project work is mainly aimed to run the DCS kit without help of provided software, by using DASYLAB programming and thus producing substitute software in place of DASYLAB. The advantage of using DASYLAB is that the software is more user-friendly and no need of knowledge of graphics programming. The other benefits gained while going through the project was enhancement in the knowledge concerned with the field like DCS operation, RS-232 ports internal registers, RS-232 & RS-485 communication protocols and of course programming language in DASYLAB.